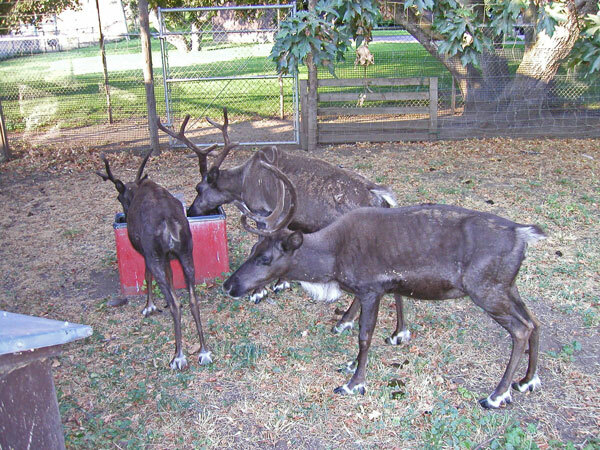 The Reindeer, known as caribou when wild in North America, is an Arctic and Sub arctic deer. 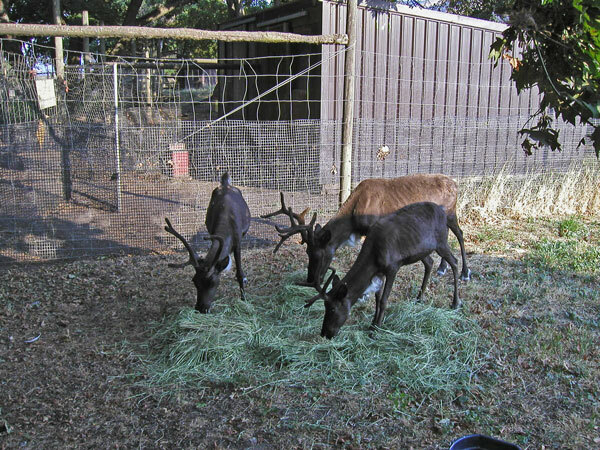 Domesticated reindeer are mostly found in Northern Scandinavia and Russia, and wild reindeer are mostly found in North America, Greenland and Iceland. Its natural occurrence is north of the 62nd latitude. In 1952, reindeer were re-introduced to Scotland, as the natural stock had become extinct in the 10th century. About 1 million reindeer live in Alaska and a comparable number live in northern Canada. There are an estimated 5 million in Eurasia, mainly semi-domesticated. The weight of a female varies between 132 to 375 lbs (60 and 170 kg) in most subspecies of reindeer, the male is slightly larger; in other subspecies the male can weigh up to 660 lbs (300 kg). 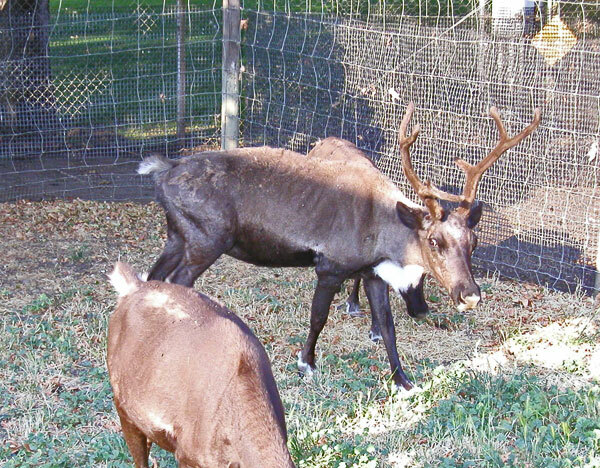 Both sexes grow antlers, which for old males fall off in December, for young males in the spring and for females during the summer. 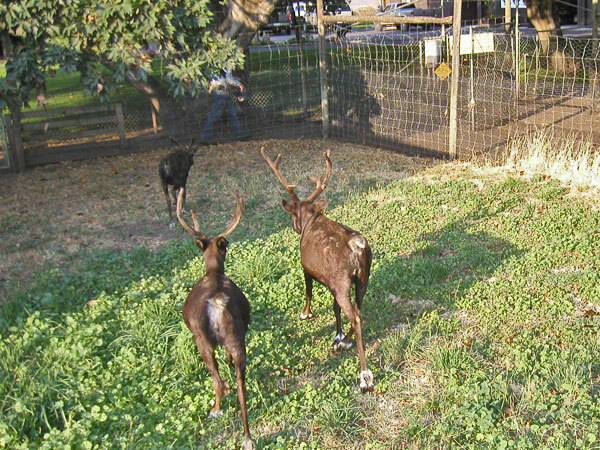 The antlers typically have two separate groups of points, a lower and upper. 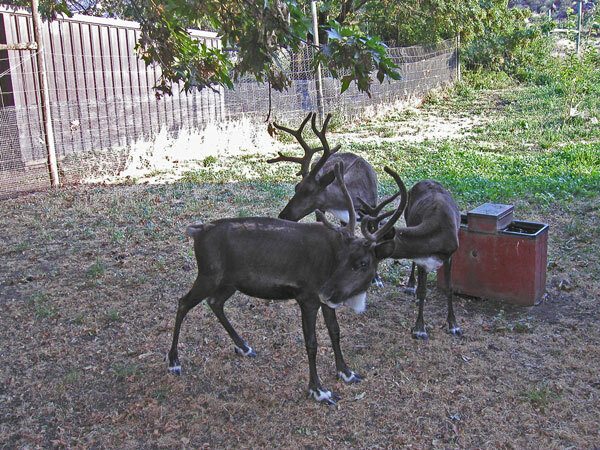 Domesticated animals are shorter-legged and heavier than their wild counterparts (caribou). The caribou of North America can run at speeds of almost 50 miles per hour (80 kph) and may travel 3,000 miles (5000 km) in a year. They mainly eat lichens in the winter, especially reindeer moss. However, they also eat the leaves of willows and birches, as well as sedges and grasses. They can also eat voles, lemmings, birds and bird eggs. 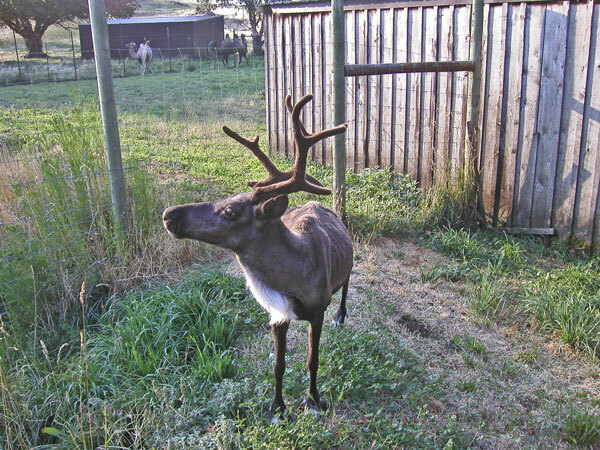 Reindeer have specialized noses that dramatically increase the surface area within the nostrils. Incoming cold air is warmed before entering the lungs, and water is condensed from the expired air before the deer's breath is exhaled. Reindeer hooves adapt to the season: in the summer, when the tundra is soft and wet, the footpads become spongy and provide extra traction. In the winter, the pads shrink and tighten, exposing the rim of the hoof that cuts into the ice and crusted snow to keep the animal from slipping. The reindeer coat has two layers of fur, a dense woolly undercoat and longer-haired overcoat consisting of hollow, air-filled hairs. A caribou or reindeer swims easily and fast; migrating herds will not hesitate to swim across a large lake or broad river. Natural threats to caribou include avalanches and predators such as wolves, wolverines, lynxes, and bears. Ravens can indirectly kill caribou calves by blinding them (eating their eyes). The Sami people of Lapland have herded reindeer for centuries. They are raised for their meat, hides, antlers, milk and for transportation. 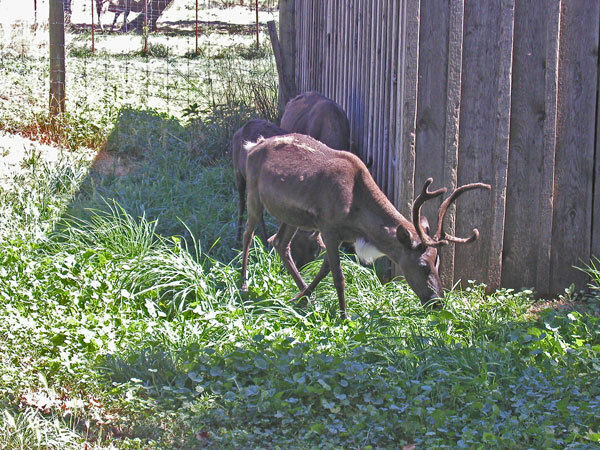 Reindeer are not considered fully domesticated, as they generally roam free on pasture grounds. Traditional nomadic herders migrated with their herds between coast and inland areas and herds were keenly tended. The use of reindeer as semi domesticated livestock in Alaska was introduced in the late 1800s by Sheldon Jackson as a means of providing a livelihood for Native peoples there. A regular mail run in Wales, Alaska used a sleigh drawn by reindeer. Wild caribou are still-hunted in North America as a source of food, clothing, shelter and tools in the traditional lifestyle of the Inuit people and Alaska Natives. 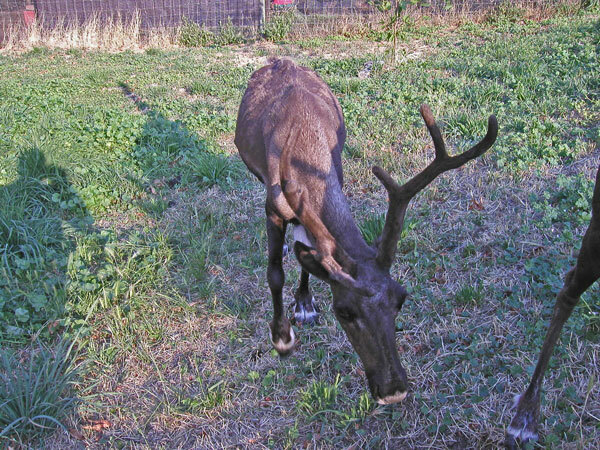 The name Caribou is thought to come from a Mi'kmaq word that means "one that paws the ground".